This lovely novel is my first experience with Berry and in it I found an unexpected gem. I was surprised by the quiet wisdom and truth in his writing. Hannah Coulter tells us the story of her life in Kentucky. From her early days with her father and step-mother in a small home, to her courting days, to the pain caused by World War II and the eventual life she settles into. It’s a beautiful look at Midwestern life, both realistic and idealistic if that’s possible. At the beginning of the story Hannah loses her mother when she is only 12-years-old. Her father remarries and her Grand Mam looks out for her. Though much of Hannah’s life is marred by grief she is a strong woman. She accepts both the good and the bad and moves forward. It reminded me a bit of the later books in the Anne of Green Gables series. Through the losses Hannah experiences in her life she paints a beautiful portrait of grief; its overwhelming presence and the continued normalcy of life all at the same time. Grief, especially when it’s caused by a war, is universally shared, but also it’s also shockingly isolating. There’s a section in the book that talks about the “ghosts” that are present at big events like weddings. Even though they may have been dead for years, you can’t help but see the whole event through the eyes of those you’ve lost. They are there in a way, their presence is felt and they’re missed by everyone. It hit home for me because I’d just experienced that at my brother’s wedding in May, missing my own Mom desperately and wishing she could have been there to celebrate with us. BOTTOM LINE: This is such a beautiful book about all the stages of life. This will absolutely not be my last Berry novel, but it was a perfect place to start with his work. Alex - I had a friend recommend it. She couldn't believe I'd never heard of him, but I'm glad I know about him now! I feel the same way you do. It's always a thrill when you discover a new author and think about all the potential wonderful books you have ahead of you. 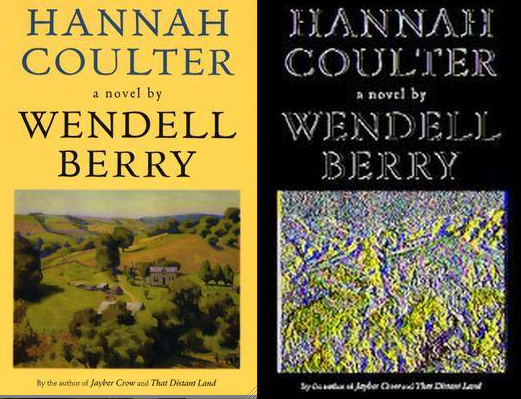 I get a little shiver of delight every time a blogger discovers Wendell Berry. He is in my top five favorite authors list, and I have enjoyed his fiction, his essays, and his poetry for the past few years. Hannah is one of my favorites. Jayber Crow is right up there, as is the short fiction collection, That Distant Land. This is about the only Wendell Berry book I haven't read. Jayber Crowe is fantastic - as is everything I've read of his. Glad you discovered him! Carrie K. - There are a few authors I feel that way about too! It's wonderful when someone new discovers a great author. I'm thrilled that I have so many of his books to read. Dale - I think I'll try Jayber Crow next. Everyone seems to love that one. Carl - I've now added that one to my must read list. If you return to it so frequently it must be good! This is the second time I've heard wild praise for Hannah Coulter. I simply must read this book now! Kat - I can't believe it isn't on more classics lists!